Neutral (The Light, The Switch, And The Diode) - NGWClub®, Inc.
One of the most asked questions is, “Why is my neutral light on all the time but brighter when actually in neutral?” Most of the time this is a neutral switch failure. However be sure to check all associated wiring and connections. A chaffed wire with a poor ground can give the same indications. What is a neutral switch you say? The Neutral Switch is a safety feature that, when working correctly, will not allow the Starter to engage while the bike is in gear. 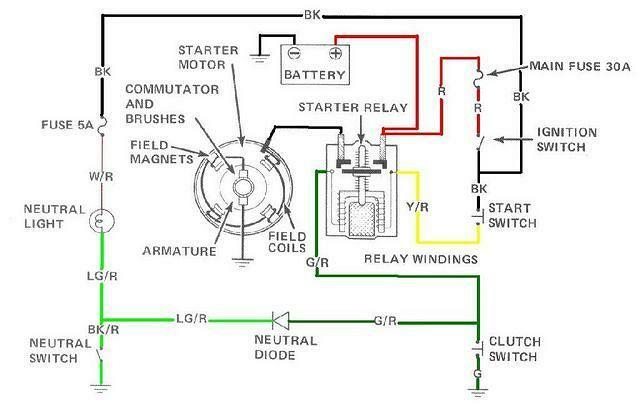 As shown in the following diagram, the starter relay, or solenoid, has a positive potential applied when the ignition switch is on and the start switch is depressed. But on the negative side, in order to get back to ground and the negative side of the battery, either the neutral switch or the clutch switch must be engaged. Tapped off the neutral switch is the wire that supplies the ground to the neutral light. The neutral diode is placed between the neutral switch and clutch switch (and the starter relay). As a diode will only pass electrical current in one direction, this allows either the neutral switch or the clutch switch to apply “ground” to the starter relay. However, when the clutch switch is activated, and the neutral switch is not, the current will not go through the diode and apply the ground to the neutral light. Therefore if your neutral light “lights” when you pull in the clutch, the diode is shorted and needs replaced. When the neutral light stays on when in gear, but not as bright as when in neutral there is a resistance in the neutral switch that is reducing, but not eliminating, the voltage (ground) being applied to the neutral light. This reduced potential is also applied to the solenoid and is not a good thing. The neutral switch sits in the lower part of the engine block, and the gunk and carbon gets built up on its contacts over time. This creates an alternate path for voltage through the switch. This alternate path is not a “direct short” and has some resistance to the current being drawn by the neutral light. Resistance whether from corrosion or carbon buildup will be dissipated as heat and drop some of the voltage being applied, hence the dimmer indicator light. If the resistance gets low enough, the safety factor of the neutral switch will be defeated, allowing the starter to operate with the bike in gear. My advice to anyone with this problem is to bite the bullet and fix it. New switches are available, as of this writing, and replacing a switch with a used switch (been there, done that) is not justified as this task is enough of a PITA to not want to do it over. While easier to replace with the engine removed, it is not impossible to do in the frame. The procedure is in the Honda Service Manual and a walk thru here. Black tape over your neutral light. Try to burn off the carbon ( http://www.gl1000.info/NeutralLight.shtml .) Didn’t work for me. Totally bypass everything by removing the bulb and connecting the green with red stripe wire from the solenoid to ground. Try cleaning the old switch with solvent (requires removal of the switch.) Didn’t work for me. Remove the neutral switch, disassemble, clean contacts, reassemble, and reinstall. I haven’t had success with disassembly, but will be trying again soon. No trouble with mine * but good to know that you've got me covered. So, if I wanted ONLY the neutral light to function (without the clutch safety), I could (per your note #6) ground the green/red, BUT leave the light in. Yes? "Just because you're not paranoid doesn't mean they aren't out to get you..."
pago cruiser wrote: So, if I wanted ONLY the neutral light to function (without the clutch safety), I could (per your note #6) ground the green/red, BUT leave the light in. Yes? Not sure what you are trying to accomplish, but if your light is on when in gear (but dimmer) it still will be doing what you propose. This is caused by a faulty neutral switch, which would still be in the circuit for the light. "The Neutral Switch is a safety feature that, when working correctly, will not allow the Starter to engage while the bike is in gear." What you propose would defeat the safety feature of the circuit without changing the operation of the light (whether good or bad.) The only way to make the light operate the way it should (if it is not now) is to fix the fault. roncar wrote: My advice to anyone with this problem is to bite the bullet and fix it. New switches are available, as of this writing, and replacing a switch with a used switch (been there, done that) is not justified as this task is enough of a PITA to not want to do it over. While easier to replace with the engine removed, it is not impossible to do in the frame. The exception of course is the '82-'83 ..... it's behind the transmission cover and can be accessed with the engine in the frame. Thanks for the bump! I've got the nasty light always on and will give the "Burn-off" method a go... I really wish I had checked that thing before I put the engine back in! Wish I had read this before I asked about the "selenium rectifier"! I think i have this problem. Bought A wing that has been stored for years, and it was put in gear. But rather than the light stays on , it stays off. How should i fix this? It is a ground isolation circuit so the first step is to inspect the wire to the switch and make sure it is intact and hooked up. Whiskerfish wrote: It is a ground isolation circuit so the first step is to inspect the wire to the switch and make sure it is intact and hooked up. Thanks, will try to inspect it.. Check the bulb first! been there, done........................!! Roncar says "if your neutral light “lights” when you pull in the clutch, the diode is shorted and needs replaced." So where do I look for the the diode (80 GL1100)? I mean ... I see it on the diagram, but where is it in real life. Thanks Ron, I'll have a look for it.